No matter how well designed and constructed, a building doesn’t really come to life until you switch on the air, water & energy systems that make it livable. We engineer the systems that transform buildings into comfortable & energy efficient places to live and work. Over the last 27 years, we have designed more than 1470 projects across the province, Canada & around the world. Electrical Engineering services including Power Systems Studies, LED lighting, variable frequency drives (VFD), Energy Conservation Strategies (including LEED, Geothermal and Solar systems), Photometric Lighting Calculations, Street Lighting and Power Distribution.. 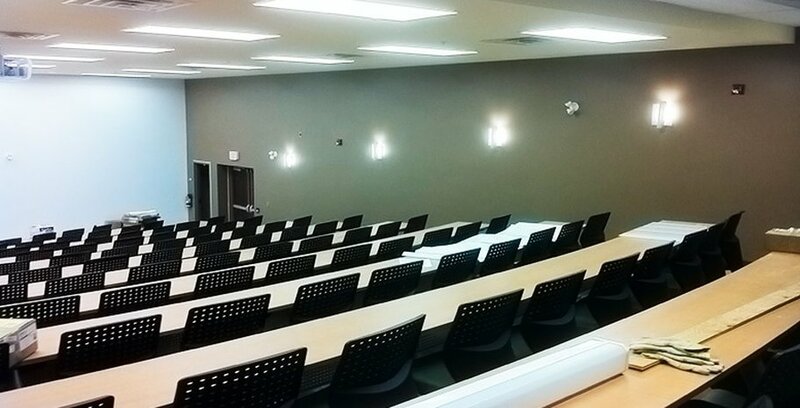 Provided design and construction services for the renovation of a Lecture Hall and Chapel at St. Paul’s College at the University of Waterloo. Special attention was required to maintain suitable sound levels for a Lecture Hall.